This article was written in 1997, and given to a friend of mine Bill, who was a member of the board from the magazine Exposure, and that he may be able to have my writing published. Bill himself, is an accomplished inventor, challenging in some of his published writings, Albert Einstein's relativity theory speed limit of light, for all mass. In presenting my writing on the following subject, I would like to point out that the staggering scientific progress in every field up to date has been achieved to my knowledge, without ever assigning a basic mechanism to either gravity or time. Acknowledging Sir Isaac Newton as the founder of the principles of gravity and if for a deeper understanding I refer to Prof. Einstein. It will give me space curvature and the final step gives me gravitons, the messenger particle theory, if I select a scientific expression for time, I have space-time. To make myself clear setting aside solar cell technology, I say that if electricity could be understood to a basic mechanical level beyond the coulomb theory, shouldnt it be possible to create a device by which the heat for example of a blowtorch can be converted into an electric current at a minimum loss of energy! In the same sense if a form of gravitational mechanics where applied shouldnt it be possible to explain gravity related phenomenon and advance in the basic understanding of matters like UFO's! I'd like you to view my effort in this frame, this article and a possible follow up could be a delight for chronic thinkers. I am basically an inventor that ventured into science actively through a never ending attempt to find a way to propel a spaceship by the manipulation of the centripetal or centrifugal force. The beginning of this research stretches nearly 40 years, hoping and considering my limits that the answers are found in simplicity rather than in complexity. 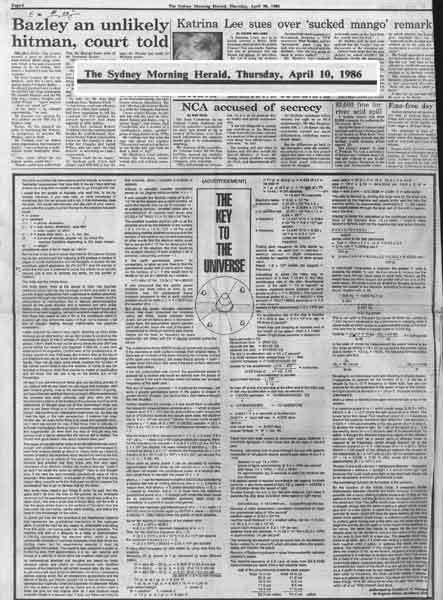 In an article that I wrote and advertised in the Sydney Morning Herald In 1986, "THE KEY TO THE UNIVERSE" I outlined an alternative way of the function of gravity. At that point my work was entering electronics from years of mechanical attempts. Having no expertise in that field I thought I needed help, but because of my unscientific presentation the response to my article was very sparse. Yet thinking about it now, it was well worth it in spite of that because people like Frank, a man that contacted me and said he was a scientist helped me to demolish my mathematical insecurity by saying "Gunther, it doesn't matter if you don't master calculus if you can prove your work arithmetically the simpler the better". John, an electronic experimental officer from a university gave me an idea to start my first electronic experiments. John himself had a gravitational theory, he stated that "the electric field of a single atom would unite with that of the second atom, the two electric fields would become one, then combining with the third atom etc, so that a force field grew as mass increased and with it the gravitational force, so explaining gravitational and molecular adhesion". At the Astro inauguration gathering to which I was invited starting under the name of" ...Mad Scientists!" I met a young man also named John. His complex postulation of gravity which he handed over to me and of which he wanted my opinion was mainly designed to contradict the big bang theory. As I understood John, gravity is a universal force (mass) dwelling through the whole of the universe flowing continuously into every star, planet, moon etc., that the continuous flow of the force into distant stellar mass from our viewpoint on earth was the cause of the redshift. This means the universe is not expanding. Help came in various ways for instance; to understand John's universal gravity flow I had to read more about Einstein and better my understanding for his work, that helped me in my work, in the contribution of the key scientist is a harvest of building blocks that you may put differently together or of some you may not use, just the same they are the foundation for our thoughts. These men may have left at some point because of knowledge that was not available at that time, not because their intellect couldnt carry them any further. 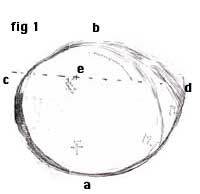 Einstein left the explanation of gravity to my understanding as space curvature. For my part I had my 1986 patent pending machine that centrifugal centripetal force manipulator, a device that converted rotational momentum into linear momentum. device hoppeled into one direction on my workbench. 19 years later, after fruitless experiments in all angles I concluded that a mechanical device could not develop a linear force from within to create a power needed to lift a spaceship. Yet the force was there approximately 0.5 Newton from a device about 30cm in diameter. Sometime back the thought had entered my mind that if every atom functioned naturally like my machine this insignificantly amount of a linear force, centre earth directed, by every atom on this planet, could account for the power of gravity. Gravity simply then becomes a mechanically enduced linear force created by the electrons orbiting the nucleus. The same principle as my invention.Where a weight in the shape of a cylindrical piece of iron, orbits the body of the machine. This orbit is manipulated in its lengths of the radius, by a variation of the angular velocity and in a sense by a variation in the weight, per orbit. I believe this device could then be considered the working model of a hydrogen atom. To express my point in 1986, I wrote "When Isaac Newton put things in order he said "that the apple didn't fall from the tree to the ground as his forebears observed but that the gravitational force of our planet was pulling the apple down to the surface of the earth." That was a great step in those days. The truth is, that the apple drives down to the surface of the earth from the tree under its own force centre earth seeking and that is the basis of my knowledge for the future." By now you must be wondering what Im trying to get at. Simply this, if we want to seriously understand UFO's you must be aware of either the technology or part of it or we must at least understand the working of gravity; as that is what we are dealing with. To make mass excel to and beyond the speed of light I wrote in 1986 in my article explaining infinitive gravitational excelleration "if we take the approximate gravitational force of 10m seconds² then (10m seconds²) is the proof of infinity, for if for every object falling towards earth the final crash would not happen, the acceleration has to go on for ever and so the force. "(Isaac Newton "any object can be made to accelerate to infinity"). We must understand here that, in space travel, according to my gravitational mechanics we are falling through space,at a continues acceleration of 1 G infirst gear, we are not being conventional propelled and that the atoms of our body are under the same command with those of the spacecraft we are not affectedby a sudden change of direction or acceleration. If we can except gravity in such a basic form, we are then provided with a foundation stone of thought, from which a human mind can progress, to understand and master such a force. Ideas such as space curvature, the graviton particle message theory, a gravitational proposals such as the universal flow of the force into stellar mass or an atom uniting electric force field, etc, each idea by itselve applied as a solution to the whole problem, permits only a narrow scope for the clarification of the complex phenomenon that we are faced with.On the other hand for what we don't know there are many ways to inform ourselves. We can follow the Van Daniken's to sift through the past. Yet how can we understand the past if we havent got enough engineering or scientific knowledge to understand the present on the doorstep into the future? We can also sort through the expert presentation of observed facts combined with the thoughts of highly competent journalists, it still doesn't revel to us the base knowledge. If Van Daniken had that on his last TV clip in his explanations and speculations he could have gone far beyond himself for what he visually presented. If William Cooper the journalist (article in" Exposure") had it, besides the interesting political aspect he presented, the technical remark would have acceded his description "nuts and bolts"
The road to the truth is barricaded. I mentioned that ten years ago in my article since then I experienced the following. In my talks with John an electronic expert, he said "Gunther, for what I know about electronics your idea can never work." His friend studying for a doctor degree in electronics at the time, being present agreed with John and his comment was even more negative. At an energy and inventors fair at Darling Harbor some years ago where I displayed some of my inventions, I had written material, video footage and models of my work. One person about my age well spoken with an intellectual face wanted to buy one of my pamphlets on display about my ideas on gravity. He acted very nervous as if he had no time or as if he was worried to be seen. I felt he was embarrassed to deal with me. to reach further then others, into the unknown. we have done all this years ago. Let me point out that this kind of space technology seems only possible since the digital electronic age and that is not so long ago. So, if you want to enter reality dont make the past the ultimate in research, that is the past, dont get entangled to deep into to days reports visual or otherwise because that is the future, at the moment still beyond us. Lets be practical, pick the path of an inventor for a change, come along with me for a moment. I am always eager to publish my progress of thought. Consider that the supreme product of an evolution will enter ultimately into the period of a mental evolution which is seeded in each one of that species in the form of intelligence leading into intellect. Advancing in a Darwinien progression where only the best individual solutions survive into the next phase. This does not have to end in self destruction if each of us cares enough and those that lead us do not ignorantly and egoistically stifle the branches of the key technology that brings us to a higher quality of existence, it must include at some stage the technology to gravitational propulsion, or else we stay earthbound and vanish. We should therefore examine every contribution; you may be inspired,to generate the lingering but unsurfaced ideas with in you and develop them to tell us about it. If you were to think deep about what I wrote in 1986 and what I write here you have already a base by which you can explain levitation, the psychic moving of objects, by some gifted persons and of course gravity itself which explains the function of UFOs etc. In 1986 I proposed that the gravitational force, being the property of every single atom; was directed centre earth seeking, by a frequency emitted from the earth centre. The aproximate centifugal/centripetal force manipulator weight orbit. My idea at that time was an atomic vibration (Niels Bohr),possibly to be found as a code frequency within the electro magnetic radiation spectrum. What I didn't know, when I wrote the article, was that people as far back as the discovery of the x-ray by Roentgen, thought that there was a frequency for everything including gravity.Nobody I know of had presented since Roentgen an atomic mechanical solution, so I am sure that people worked on centrifugal force manipulations but did not transfer that mechanism, in thought, to the function of an atom.To fall in line with science today. lets presume for the moment that it is not a code frequency but gravitons that guide the direction of the gravitational force of every single atom. Then the psychic phenomenon of objects moving or flying through a room, levitation, UFO's etc, explains itself by either gravitons being guided mind controlled conciously,unconciuosly or purposely electronically into mass to change the gravitational mechanics of the atoms, beingcentre earth controlled, between 1 to 180 degrees, in respect to the surface of the planet. Transmittion of gravitons or electromagnetic gravitational vibration code frequency. 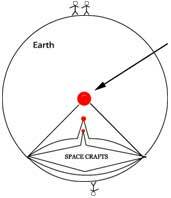 Development of spacecrafts based on the gravitational mechanics of the earth. Flight direction of spacecraft according to the gravitational mechanics. The spaceship a quarter earth diagram with no mass in opposition and if the graviton transmission is continuos we are falling through space accelerating infinitive. With my knowledge a few years ago I wrote a story explaining an UFO event in the Nullabor region where I described the sighting as being a space animal. I sent the story to a couple of newspapers guess what? No takers! But still as you can see if you invent a solution you can postulate explaining phenomenon and that could be more beneficial for progres than digging in the past or go beyond. together orbit a large galaxy or galaxies the same cycle could retain. The implications?" If we imagine that every planet accompanied by at least one moon of every solar system in the universe would enter eventually into an orbit, where live forms as we know them evolve and sustain for millions of years, provided the mass composition and spin of that planet creates surface and atmospheric conditions like that on earth. Then how much live would there be in the universe?And most of you wonder still, whether UFOs are real! Again if you have an open inventive mind you can see far beyond the conservatism of some modern intellect. Also some prominent scientists do have the gut feeling when professor John Archibald Wheeler suggested" Until we know the true constitution of the world, I think we have to depend much more on what wise men of the past have told us ......" and that phrase (rinsed in fire.....) comes from the wisest known to men.